Snakes are reptiles, and most species of snakes will follow the general rules of reptilian reproduction -- the mother will lay a clutch of eggs that will hatch into baby snakes. Such snakes are referred to as oviparous. A few exceptional species of snakes diverge from this general rule. They are referred to as viviparous, and they give birth to live young. Both oviparous and viviparous snakes have uteri, or wombs; however, only viviparous snakes form placental attachments between their uteri and the developing fetuses. The terms oviparous and viviparous come from Latin words and literally mean egg-laying and live-bearing, respectively. Oviparous animals such as reptiles, birds and fish are familiar: They lay eggs that hatch into juveniles after an incubation period. Viviparous animals fall into two categories: Those who support their fetuses by a placental connection, like mammals, and those who produce eggs and incubate them internally, leading to hatching and live birth. In the past, viviparous animals that retain and incubate their eggs internally were referred to as ovoviviparous -- this terminology was abandoned by biologists after study revealed they also develop placentas to aid in gas exchange for the developing fetuses. Oviparous snakes are the most common type of snakes. Most snakes will bury their eggs in suitable locations, then leave them to develop and hatch on their own. 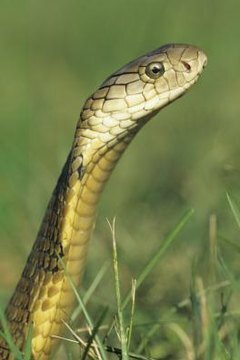 Some species, like king cobras, will guard their nests and even stay with the juveniles for a few days after they hatch. Incubation periods will vary by species, as will the number of eggs each female lays. Oviparous snakes have uteri, however they do not play important roles in development of the eggs -- most of the egg development takes place in the ovary and oviduct of oviparous snakes. Viviparous snakes give birth to live baby snakes. Most viviparous snakes do this by producing egg yolks that nourish the developing fetuses and by forming placental attachments to the uterus in order to exchange oxygen, water and carbon dioxide waste between the fetuses and mother. Once the baby snakes are fully developed, they hatch inside the mother snake and later emerge as live young. In rare instances, viviparous snakes support their developing fetuses by placenta only, just like mammals. Boa constrictors, garter snakes and rattlesnakes are viviparous species. Mammals are the most notable viviparous members of the animal kingdom, but certain species of sharks, amphibians and reptiles also give birth to live young. From an evolutionary perspective, viviparity has some advantages over oviparity -- the developing offspring are less vulnerable to predators inside the female, and, in cold weather climates, the internally retained eggs can be incubated at warmer temperatures by the female. The disadvantages of viviparity are that it requires higher energy inputs by the female -- it may decrease her total number of offspring and frequency of reproduction.